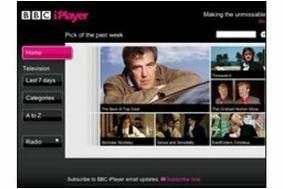 BBC will Beta test iPlayer on Freesat in late November | What Hi-Fi? Writing in his BBC blog, Rahul Chakkara – Controller of TV platforms at the BBC – says: "The MHEG-IC (MHEG-5 Interaction Channel) standard has been adopted by Freesat and incorporated into the DBook 6.1 standard used in Freeview HD devices. "We have been developing the BBC iPlayer using this standard, and I expect to start a Beta deployment by the end of November using capable Freesat devices." A spokeswoman for Freesat adds: "I can confirm that iPlayer will be coming to Freesat soon, with Beta testing beginning this month." The full iPlayer/Freesat service is expected to launch next year. Freesat will be the first subscription-free platform to get a full version of the iPlayer, and viewers will not require any additional equipment over their existing Freesat set-top box to watch it. However, the set-top box will need to be connected to a broadband connection via the Ethernet port to receive the iPlayer service. iPlayer is already available on Virgin Media's cable TV service, and is being rolled out across other platforms.